I was asked by my friend, Finny McConnell: founder, leader and singer in the brilliant Canadian Celtic punk band, The Mahones, to help spread the news about a former Mahone’s tragic, early passing and to try to let everyone know how much he was loved. 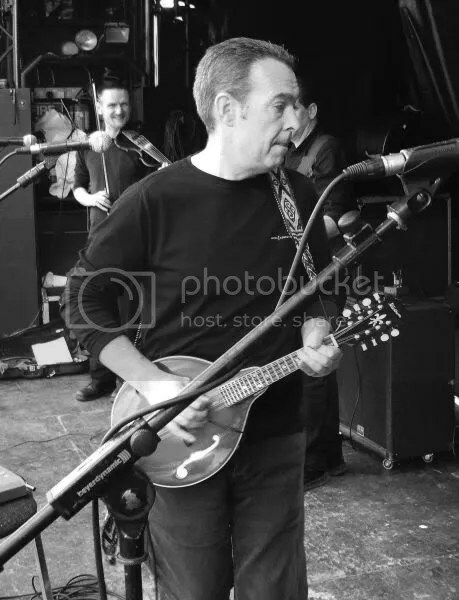 Because I have been a fan of the band, since its inception (in Kingston, Ontario) in 1990, and I knew Paddy Concannon a little and have very fond memories of his wonderful mandolin playing, his smile, laughter and amazing sense of humor, I didn’t hesitate to agree. We would like to share this loving tribute to Paddy, written by his friend Margaret Leitch with input from his beloved wife Helena and her sister Ann. Thin Lizzy’s “Jailbreak” boomed out across a quiet cul de sac in Derry’s Grangemore Park on Sunday 22nd February this year as the members of “Gravediggers Grin” carried their great friend and founder member Paddy Concannon who died so suddenly and unexpectedly at only 50 years of age. Paddy had a big personality and inspired all who knew him. Everyone was entitled to Paddy’s opinion on everything from music to fishing to cooking – whether you liked it or not! 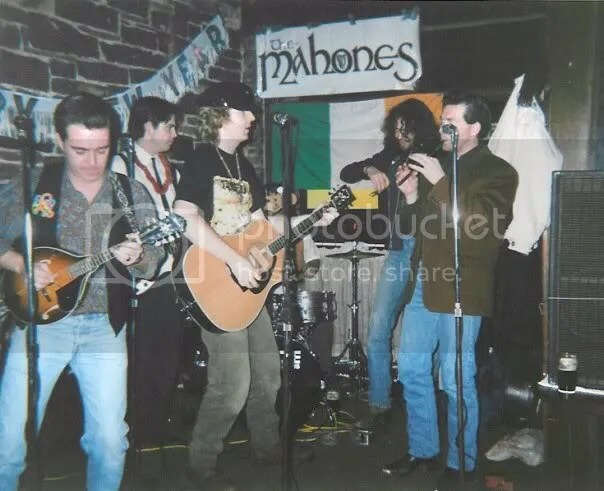 Paddy spent time in the United States and Canada where he was mandolin player/singer/song writer with Canadian based band The Mahones. On his return to Derry in the 1990’s he formed Gravediggers Grin which was described as being the best Celtic Rock Band since Horslips. Band members of the Grin included Joe Dermot and Shaun. In the late 70’s and early 80’s this motley crew had been playing with Paddy as members of up and coming bands Psycho and Two Days Dead. Last St. Patrick’s Day in the Guildhall Square a brilliant performance by Gravediggers Grin re-launched the Band with plans to perform live again, re-record their album and create their own website. On the Sunday before Paddy’s premature death the Grin played a stomping gig in Masons Bar. At the core of Paddy’s enthusiasm for life was the love of his family, friends, music and travelling the world. Paddy was happiest when the house was full of family and friends with any excuse for him to cook or light the BBQ, get the beer in and subject all to a medley of the best of rock which inevitably meant a rendition of Gary Moore’s Tribute to Phil Lynott!! Paddy’s favourite place in the world was Ireland whether fishing in its many loughs and rivers or just walking through Swan Park and onto Father Hegarty’s Rock in Buncrana where he had spent many memorable summer holidays with his family as a child. He was happiest looking out for “fishy” rivers everywhere he went. There were many tall tales of the “ones that got away” whilst Paddy looked like he was auditioning for a part in “Hooked on Fishing” turned out in all the gear. Paddy, his wife Helena and children holidayed as often as they could and visited many European countries however, his main passion was discovering Spain by travelling around the south east coast. His ideal way of “chilling out” was to call to the bar at the Marina in Benalmadena to feed the fish. Stories of his frequent visits led to the Bar being renamed by close friends and family as “Paddy’s Bar” where he spent time celebrating Helena’s birthday the week before his death. Helena received many letters of sympathy but was moved by a particularly poignant one from a young girl currently travelling in Australia who worked with Paddy for a short time. She described Paddy as being an inspiration who encouraged her to travel and see the world while she was young and able and to “think outside the box” as he would have said. A tribute indeed from one so young. This combined with the many callers to his home and attendance at his funeral is testimony to the man that Paddy was. Paddy will be sadly missed by all who knew and loved him but he will live on through his family, friends and his music and will never be forgotten. The Derry Sunday Journal has posted this obituary for Paddy and you can leave your message for his family and a token of respect at this link: http://announce.jpress.ie/1870391. The wife, sons, daughter and extended family of the late Paddy Concannon wish to express their sincere thanks to everyone who sympathised with them during their recent bereavement. We would like to convey our deep appreciation to the kind friends and neighbours who supported us during the wake and funeral. We would also like to thank Fr. Stephen McLaughlin for his thoughtful and loving words at the Mass and the Paramedics and doctor for all their efforts. Our deepest gratitude goes to W.J. O’Brien & Son, Funeral Directors who carried out the funeral arrangements in a professional and dignified manner. As it would be impossible to thank everyone individually we hope that this acknowledgement will be accepted by all as a token of our sincere gratitude and appreciation. Paddy Concannon, you will be missed by a great many friends in Kingston, Ontario and all over Canada. You were a unique, creative and lively soul who always made people smile and we want you to know that we love you. May you forever rest in peace.